FIGURE 1 Components of an epithelial cell layer. Adjacent epithelial cells are joined by junctional complexes ("tight junctions''), which form the closed ends of the lateral intercellular spaces between cells. The luminal membrane borders the urinary (luminal) side of the nephron, whereas the basolateral membrane consists of the lateral membrane bordering intercellular space and the membrane on the basal (interstitial) side of the epithelial cell. 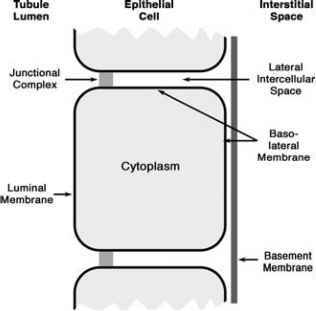 The basement membrane separates the basal side of the epithelial cell layer from the extracellular fluid in the interstitial space. epithelial layers of the skin and respiratory tract separate the extracellular fluid from, respectively, the external environment and inspired air. Most epithelia, e.g., the nephron and the gastrointestinal tract, serve not only as a barrier that protects the extracellular fluid, but they also modify the composition of the fluid on the apical or luminal side by absorptive and secretory processes that transport solutes and water, respectively, out of or into the apical compartment. The epithelium of the nephron is somewhat different from other epithelia because it consists of the single-cell epithelial layer and a basement membrane, with no other cell layers on the basal (or serosal) side. Epithelia in most other tissues have a thick serosal matrix consisting of stromal fibers and other tissues such as muscle layers. The absence of these serosal elements in a nephron allows the length of the path from the lumen to the peritubular capillaries running through the interstitium to be quite short, on the order of 20-30 mM, and permits an efficient exchange of large amounts of solutes and water between the lumen and the capillaries. Solutes and water can move between the lumen of the nephron and the interstitium by one or both of two routes: through the cells or between the cells. Most substances that utilize the transcellular route require specialized transporters that facilitate their movement across the apical and the basolateral membranes, and these transporters are generally regulated to produce physiologic changes in the rates of reabsorption or secretion. The paracellular route involves movement through the junctional complex and the lateral intercellular space. The lateral intercellular space is a free solution layer that provides little resistance to solute or water movement in the nephron. The junctional complexes are often referred to as ''tight junctions'' because they typically serve as relatively impermeant barriers to the movement of most solutes and even water. However, in many epithelia such as the proximal tubule, the junctional complexes are quite permeable to many ions and small solutes such as urea. The junctional complexes in such epithelia are often referred to as ''leaky,'' and they have a low electrical resistance. Junctional complexes have long been assumed to be relatively nonselective, such that the permeability of a solute is determined solely by its size and valence. However, more recent evidence has shown that the junctional complexes in some epithelia may provide selective channels through which specific ions can move. This is the case with paracellin, which, as will be discussed in more detail in Chapter 27, allows Mg2+ to be reabsorbed through the paracellular pathway in the thick ascending limb of the loop of Henle. The active reabsorption of Na+ is the most important active transport process in the nephron. 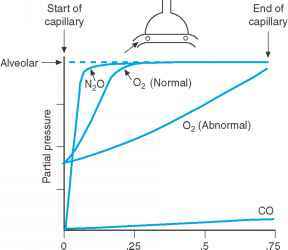 It occurs by the same basic mechanism in all nephron segments and it accounts for the majority of oxygen consumed by the kidney. As in the case of many epithelia, Na+ reabsorption is driven by Na+,K+-ATPase in the basolateral membranes. As discussed in Chapter 3 (''Membrane Transport'' section on ''The Na+-K+ Pump''), Na+,K+-ATPase actively transports three Na+ ions out of the cell in exchange for the transport of two K+ ions into the cell. The operation of this ion pump maintains the normal low intracellular Na+ and high intracellular K+ concentrations as well as the transmembrane electrical potential difference, which is normally oriented with the cell negative by 60-90 mV with respect to the extracellular fluid. The energy required for the operation of the ion pump is provided by ATP hydrolysis. FIGURE 2 Fundamental mechanism of Na+ reabsorption in all nephron segments. Na+ is extruded from the cell by the Na+,K+-ATPase located in the basolateral membrane. This transporter pumps three Na+ ions out of the cell in exchange for two K+ ions, which enter the cell to maintain the high intracellular K+ concentration. Na+ enters the cell passively by moving down its electrochemical potential gradient from the higher concentration in the lumen to the lower concentration in the cell. The greater negative voltage of the cell interior also adds to the electrochemical potential gradient for Na+ entry. The mechanism of Na+ entry across the luminal membrane (indicated by ''X'') is left unspecified in this diagram, and occurs by a variety of transporters depending on the nephron segment. Na+,K+-ATPase transporters are found exclusively in the basolateral membranes of all nephron segments; therefore, Na+ can be actively extruded from the cell only into the lateral intercellular space and the interstitial space that borders the basolateral membrane, and not into the lumen. The low intracellular Na+ concentration maintained by the Na+,K+-ATPase and the negative intracellular electrical potential difference provide a large electrochemical potential difference that favors the passive entry of Na+ down its electrochemical gradient into the cell. Throughout the nephron, Na+ enters the cells much more easily across the luminal than across the basolateral membrane, and then is actively transported into the interstitium by the Na+,K+-ATPase. Differences in the details of Na+ reabsorption among nephron segments relate only to the mechanism by which Na+ enters the cells across the luminal membrane, i.e., the X transporter in Fig. 2. The movement of Na+ into the cell is ''downhill'' and embodies a considerable amount of potential energy—energy that can perform work. In the proximal tubule, this energy is used to drive the reabsorption and secretion of other solutes by various specialized transporters in the luminal membrane as discussed later in this chapter. In fact, Na+ is the only quantitatively important substance whose transport is directly coupled to metabolic energy production in the proximal tubule. 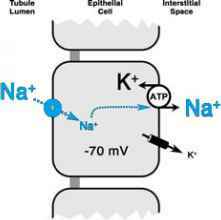 The energy required for the transport of most other solutes into or out of the proximal tubule is derived from the Na+ electrochemical potential difference that is generated by the Na+,K+-ATPase. The transporters responsible for reabsorptive and secretory processes in the nephron were first identified only by their functional characteristics, but during the past 20 years the genetic messages for most channels and carriers in the kidney and other epithelia, including Na+,K+-ATPase and the various luminal membrane Na+ transporters, have been determined by DNA sequencing. Knowledge of the amino acid sequence (from the DNA sequence) in turn permits models of the structure of the transport proteins to be developed. These analyses have revealed marked similarities among transport proteins, allowing them to be grouped into families whose members have a high degree of homol-ogy, that is, similarity of structure and function. Furthermore, the homology extends across species, ranging from bacteria to humans. This conservation of structure during evolution is a clear indication of the importance of such transporters to survival. Most transport proteins have 2-12 regions (domains) consisting of stretches of relatively lipophilic amino acids. The lipophilic regions allow the protein to reside as a complex structure within the membrane, where it provides the route for transmembrane transport. In most cases the molecular mechanisms that allow a carrier to transport a specific substance have not been established, but it is clear that these specialized proteins possess specific binding sites for the molecules they transport. Another characteristic of many epithelia is the presence of a transepithelial voltage, or an electrical potential difference (PD), between their luminal and interstitial sides. A transepithelial voltage implies that there must be a difference between the voltage across the apical membrane and that across the basolateral membrane. The voltage across the basolateral membrane in most segments of the nephron, as in nonepithelial cells, is determined by the dominance of K+-selective channels (see Fig. 2), as discussed in Chapter 3 (''Membrane Transport,: in the section ''What Is the Origin of Vm?'') and Chapter 4 (section on ''Ionic Mechanisms of the Resting Potential''). Thus, voltage between the cytoplasm and the interstitial (extracellular) fluid is near the K+ diffusion potential, or —60 to —90 mV. The voltage across the apical membrane of individual nephron segments, however, varies considerably and depends on ion conductances that are present in the apical membrane. For example, if the luminal Na+ transporter in Fig. 2 were a Na+ channel, it would cause the voltage across that membrane to be depolarized in much the same way that a nerve membrane is depolarized by the opening of Na+ channels. (However, epithelial Na+ channels, in contrast to those in nerves, are not voltage inactivated and remain open much longer.) Thus, for example, if the voltage from the lumen to the cytoplasm is only 30 mV, whereas the voltage from the cytoplasm to the interstitium is —70 mV (as in Fig. 2), the transepithelial voltage could be as high as —40 mV. Why not exactly —40 mV? The presence of a transepithelial voltage also depends on the electrical resistance of the paracellular pathway. If the resistance of the junctional complexes is very high, i.e., if the junctions are truly tight, the transepithelial voltage approaches the maximum of —40 mV in this example. However, if the junctions are very leaky to ions as is the case in the proximal tubule, ion movement through the paracellular pathway effectively short-circuits the epithelium and diminishes the transepithelial voltage.